One of my lucky readers is going to be styling at the pool this summer. Well, we all can be styling thanks to my blog sponsor, Tricia with Thirty-One Gifts. 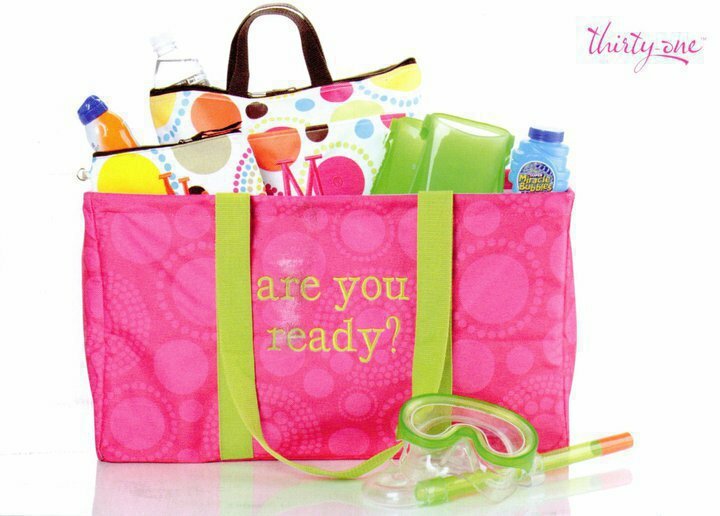 After yesterday's post, "Packing a Boden Swimsuit and Much More in My Pool Bag" which is a humorous look at going to the pool with kids in tow, Tricia decided to create a Hines-Sight Blog Tote Special so that all the mamas out there can pack their suit, their children 's suit, sunscreen, toys, sippys, snacks, towels, and even have room for a non-breakable wine glass (some days you just need it) in one gorgeous and roomy bag. In a random draw, I'm going to giveaway a Thirty-One Gifts Large Utility Tote . Look at all the loot that can go in this bag. The winning person can choose their preferred pattern and personalization for the tote as a gift from the Hines-Sight Blog and Tricia with Thirty-One Gifts. This is a $36 dollar value with personalization. What would be some good sayings for the tote? For a little Friday fun, let's name your new tote. Just kidding! You get to name your own tote if you win, but it wouldn't be Friday fun if we didn't play a little bit. How about? My Other Bag has the Liquor! Eveything but the Kitchen Sink! Sure feels like it sometimes, doesn't it? Oh, I know what would be good. Let's get serious! This tote can be yours and I'll share with you on how you can enter to win it, but let's talk about the Hines-Sight Blog Thirty-One Gifts Special first for our serious shoppers. If you have some Thirty-One items you want to order after viewing Tricia's website, she'll give you a free non-personalized tote for the first $31 dollars you spend in merchandise. After that, you can get a tote for $9 dollars for each additional $31 dollars spent. You can personalize it an a minimal cost. If you are on the ball and are already thinking about Christmas gifts then this is your chance to get some free totes. All you have to do is e-mail Tricia at patriciaedmundson@hotmail.com or call her at 919-741-8403 and tell her you want to be part of the Hines-Sight Blog Tote Special. You have to place your order by June 27. Want to win one by just being a reader of my blog? Look on page 42-43 of the virtual catalogue to see if you would want a pattern other than pink swirls pictured because Tricia will need get your choice of pattern and personalization choice by the end of June. It will be a quick turn-out from notifying the winner and getting your choice into Tricia. Leave a comment here (If you do not have a Google ID then you can use anonymous, but make sure you include your name and e-mail) and tell me your favorite slogan that I named for the pool tote or name your own. If you qualify for any extra entries, let me know. ﻿Good luck and have a great weekend with lots of fun. PS. 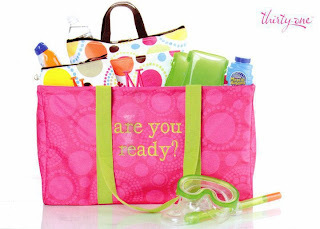 You may have known this, but the Large Utility Tote can be used for anything, not just for carrying to the pool. Toys! Books! Groceries! Storage! Holiday Decorations! I could come up with a lot of names and slogans for its uses, but that's another post.